Like many others, I had a pay rise of almost 30% in 1975. It made little difference to our standard of living since costs rose by a similar amount. By the end of the year the money we had saved during our period of living, mostly at the company’s expense, in South Africa was gone. I sold the Mini back to my brother-in-law and began cycling to work every day. By now, I was our department’s representative for the Courtaulds’ Senior Staff Association which had, under new trade union legislation, become a trade union. To give an idea of the group of employees that this small union represented it is perhaps helpful if I outline the archaic class divisions that were still extant in British workplaces at the time. At the bottom of a pyramid were ordinary workers who operated machines or practiced crafts, essentially work with the hands rather than the head. Such workers were usually paid by the hour with bonuses earned if agreed rates of individual or departmental production were exceeded. Next were clerical staff and those who supervised the hourly paid workers. These were paid a weekly wage which could be augmented by shift allowances and overtime paid at an hourly rate, derived from the weekly wage divided by the number of hours in the standard working week, and then factored up depending on whether the overtime was undertaken on a weekday or at the weekend. Finally there were managers and professional staff who were paid a monthly salary regardless of the number of hours worked. In brief these were referred to, in Courtaulds, as “hourly paid”, “weekly staff” and “monthly staff”. For practical reasons, there came a time – before I joined the company – when weekly staff received their pay monthly, so the two staff categories were redesignated “group 1 staff” and “group 2 staff”. Each of these was represented by a staff association. Very few “group 2 staff” belonged to a traditional trade union, but, under the new legislation, the members decided that the “Group 2 Staff Association” would become a union. I suppose I should add that hourly paid workers worked longer hours than office based staff. When I started work, in 1958, the standard working week for manual workers was 44 hours which soon reduced to 42. Meanwhile “office” hours reduced from 39 to 37.5. I think that is where they remained in the mid 1970s. As a representative I found myself attending meetings and discussing employment terms and conditions. I got to know some of the other representatives quite well, among them the representative for the Structural Engineers who occupied an office next to ours and with whom I also had occasional contact on technical matters. One day in early 1976 he came to my desk to ask how busy I was; would I have time to look at a job he had been asked to evaluate at our Derby factory? I told him I was close to finishing the Derry project and suggested he talk to my boss. The upshot of that conversation was that I spent about 20 months – from Easter 1976 until the end of 1977, commuting daily to Derby. 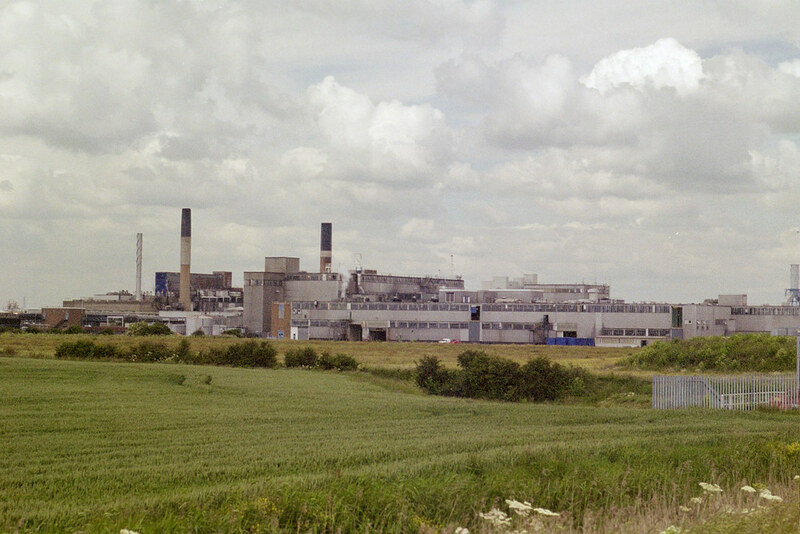 The Derby complex consisted of several different manufacturing units. One of the most important products was celulose acetate, both in the form of a textile fibre and in granular form as a filler for all manner of products from wallpaper paste to ice cream. It is manufactured by dissolving wood pulp in acetic acid. Acetic acid is made from ethylene. The company operated in-house ethylene and acetic acid production processes. The ethylene plant was old and inefficient and the company had decided to purchase and install a replacement. This necessitated the strengthening of the supports for pipes that carried feedstock to – and product from – the proposed site as well as services like air, steam, water and electrical cables. My colleague had been asked to evaluate the condition of the existing supports then design and price any necessary strengthening. I began daily commuting to Derby after Easter 1976, as Hereford United were looking increasingly like becoming third division champions. Designing a long pipe line is not a simple matter of drawing a line from A to B and around corners. You need to incorporate provision for expansion and calculate the loads that will be imposed on the supporting structure. Only then can the line be broken down into manageable sections and manufacturing drawings produced. In the summer, as I completed various sections of pipework detailing, a contractor was appointed to manufacture and install them. Now I became responsible for over-seeing the delivery of materials to site and then the actual work being undertaken by the contractor. Meanwhile, back in Coventry, work proceeded on the design of the new plant in conjunction with a Dutch company. In due course materials for that began arriving on site and, again, I was responsible for checking it all in. In the autumn a Site Engineer was appointed to supervise the installation of the plant, with me as his assistant. His name was Frank and so was that of the Dutch company’s English Engineer – potentially a very confusing state of affairs.